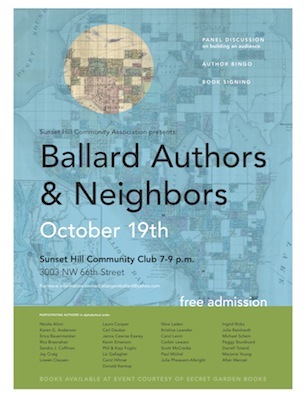 More than 30 Ballard-area authors gather for an event about writing and publishing Oct. 19, 7-9 p.m., at the Sunset Hill Community Center. More than 30 Ballard-area authors gather for an event about writing and publishing Oct. 19, 7-9 p.m., at the Sunset Hill Community Center. The event includes a panel on building an audience, “Author Bingo,” and book signings.